What will New Horizons see when it reaches the Kuiper Belt object 2014 MU69? This artist’s concept imagines one possible scenario.Johns Hopkins University Applied Physics Laboratory/Southwest Research Institute (JHUAPL/SwRI). NASA’s New Horizons spacecraft changed our view of the outer solar system forever when it flew by Pluto in 2015. Now, it’s on its way to the next destination: a Kuiper Belt object (KBO) known only as 2014 MU69. Although the spacecraft won’t reach its target until New Year’s Day in 2019, NASA is already looking ahead to learn as much about 2014 MU69 as possible, thanks to a convenient temporary alignment that recently allowed the object to pass in front of a background star. The passage, called an occultation, occurs when objects “line up” in the sky as viewed from Earth. When an object, such as an asteroid, planet, dwarf planet, or KBO, passes in front of a distant star, astronomers can watch the way the starlight dims and returns to gain information about the object passing in front of it. This information can include size, shape, and even whether the object possesses rings, moons, or an atmosphere. The recent occultation was visible from the Southern Hemisphere; the New Horizons team used 24 mobile telescopes in Argentina to view the event, which lasted only about two seconds. This effort, which thus far has yielded five successful occultation detections, is vital to the characterization of 2014 MU69 before New Horizons arrives. That’s because this tiny, distant object is poorly understood; currently, it’s believed to span about 14-25 miles in diameter (22-40 kilometers), but little else is known about its shape and composition — thus far. As 2014 MU69 passed in front of a distant star as seen from Earth, the star’s light winked out. The time difference between each frame in this image is 0.2 seconds. Now, armed with the data from this occultation and two additional recent occultations (June 3 and July 10), the New Horizons team will get to work to better understand the spacecraft’s next stop. Currently, New Horizons is 38 astronomical units (AU; 3.5 billion miles [6 billion km]) from Earth and just over 4 AU (400 million miles [600 million km]) from 2014 MU69 (which sits more than 4 billion miles (6.5 billion km) from our planet. It’s zipping along at nearly 9 miles per second (14 km/s). At its current location, it takes light — and radio signals — a little over 5 hours and 15 minutes to travel one way between Earth from the spacecraft, and vice versa. However, the spacecraft is currently in the midst of a 157-day “hibernation,” which began in April. An artist’s rendition of Kuiper Belt Object MU69, which New Horizons will visit in January 2019. A primitive solar system object that’s more than four billion miles (6.5 billion kilometers) away passed in front of a distant star as seen from Earth. Just before midnight Eastern Time Sunday (12:50 a.m. local time July 17), several telescopes deployed by the New Horizons team in a remote part of Argentina were in precisely the right place at the right time to catch its fleeting shadow — an event that’s known as an occultation. In a matter of seconds, NASA’s New Horizons team captured new data on its elusive target, an ancient Kuiper Belt object known as 2014 MU69. Weary but excited team members succeeded in detecting the spacecraft’s next destination, in what’s being called the most ambitious and challenging ground occultation observation campaign in history. “So far we have five confirmed occultations,” said Marc Buie of the Southwest Research Institute (SwRI) in Boulder, Colorado, holding up five fingers as New Horizons scientists pored over the exhilarating initial data. Buie led a team of more than 60 observers who battled high winds and cold to set up a “picket fence” of 24 mobile telescopes in a remote region of Chubut and Santa Cruz, Argentina. Their goal: to spot the shadow of the mysterious Kuiper Belt object (KBO) where New Horizons will fly by on New Year’s Day 2019 – to better understand its size, shape, orbit and the environment around it. Before these observations, only the Hubble Space Telescope successfully detected MU69, and even it had not been able to determine MU69’s size or shape. “Planning for this complex astronomical deployment started just a few months ago and although the odds seem daunting — like finding a needle in a haystack — the team succeeded, thanks to the help of institutions like CONAE (Argentina’s National Commission on Space Activities), and all the goodwill of the Argentinian people. This is another example of how space exploration brings out the best in us,” said New Horizons Program Executive Adriana Ocampo. This was the third of three ambitious occultation observations for New Horizons, and all contributed to the success of the campaign. On June 3, teams in both Argentina and South Africa attempted to observe MU69. On July 10, researchers using NASA’s Stratospheric Observatory for Infrared Astronomy, or SOFIA, studied the environment around MU69 while flying over the Pacific Ocean from Christchurch, New Zealand. 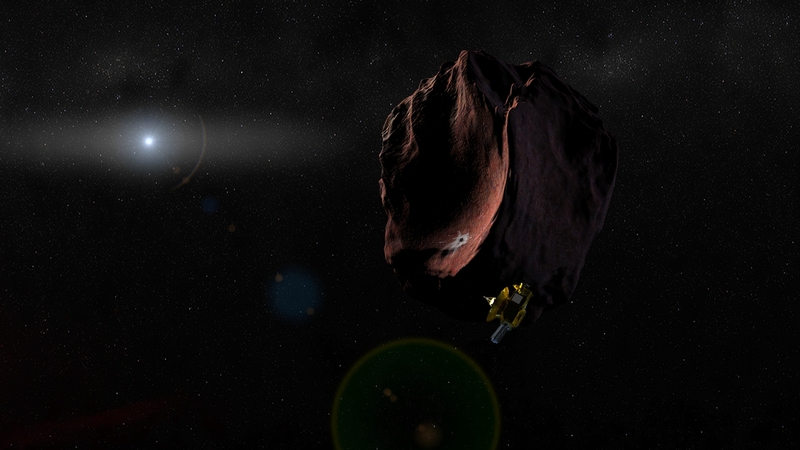 When New Horizons flies by it, MU69 will be the most distant object ever explored by a spacecraft, over a billion miles farther from our sun than Pluto. This ancient Kuiper Belt object is not well understood, because it is faint (likely 14-25 miles or 22-40 kilometers across) and so far away. To study this distant object from Earth, the New Horizons team used Hubble Space Telescope and Gaia satellite data to calculate where MU69 would cast a shadow on Earth’s surface. Both satellites were crucial to the occultation campaign. It will take weeks for scientists to analyze the many datasets from the multi-faceted campaign. This advance observation is a critical step in flyby planning before the New Horizons spacecraft arrives at MU69 on Jan. 1, 2019. Follow the mission at the NASA New Horizons website, the mission’s KBO Chasers page, and #mu69occ. Marc Buie, New Horizons occultation campaign lead, holds up five fingers to represent the number of mobile telescopes in Argentina initially thought to have detected the fleeting shadow of 2014 MU69. The New Horizons spacecraft will fly by the ancient Kuiper Belt object on Jan. 1, 2019. Credits: NASA/JHUAPL/SwRI/Adriana Ocampo. New Horizons Co-Investigator Amanda Zangari was the first occultation campaign scientist to see the telltale signature of MU69 while analyzing data from July 17, saying, “We nailed it spectacularly.” Credits: NASA/JHUAPL/SwRI/Adriana Ocampo. Far, far past Pluto, the most distant object humanity has ever visited, there’s a tiny world fainter than any seen in that part of our solar system. Its dark orbit reaches a billion miles beyond the former ninth planet. But 2014 MU69, as it’s labeled by astronomers, is just a few dozen miles across — too scant to be spherical. There’s nothing particularly special about it. Thousands of similarly mysterious and icy worlds lurk in these celestial suburbs. Yet it’s precisely its banality that makes this little prince of a planet so special — 2014 MU69 is made of the very stuff of creation. And on Jan. 1, 2019, an army of astronomers will turn their gaze to this world for a few hours, as NASA’s New Horizons spacecraft blazes by at some 8 miles per second. At the American Astronomical Society’s Division for Planetary Sciences meeting in Pasadena, California, this week, astronomers discussed how the spacecraft’s next target is coming into focus. A team has been using the Hubble Space Telescope, which also first detected 2014 MU69 during a hunt for additional New Horizons targets, to learn more about the distant world. The scientists believe 2014 MU69 is what’s called a cold, classical Kuiper Belt Object. The Kuiper Belt is a disk-shaped region of icy objects past Neptune. But Pluto isn’t part of that classical population. The distant dwarf planet crosses Neptune’s orbit, and that proximity lead it to collide with other objects — large and small — over the eons as giant gaseous worlds shuffled about our outer solar system, flinging off space rocks. So, much of Pluto’s ancient history was erased in encounters with other worlds. And similarly, comets and asteroids, which are also excellent time capsules, have interacted with other objects and been bombarded by solar radiation. But cold, classical objects like 2014 MU69 orbit further out. They are pristine, primordial remnants from the days our system began to coalesce out of the solar nebula. Primordial means that 2014 MU69 could have existed before there were dinosaurs, or trees, or eyes to see them, and before there was even a fully formed Earth or a sun to cast a dim light on its distant surface. Hubble observations have helped them gain confidence that 2014 MU69 is part of that cold classical population because its surface is red. And Hubble’s catalog of thousands of other known such objects shows that the tiny object’s reddish hue is an excellent match. Its surface is redder than Pluto, but not quite so red as Mars. “The data confirms that on New Year’s Day 2019, New Horizons will be looking at one of the ancient building blocks of the planets,” says Amanda Zangari, a researcher on the New Horizons team. That red surface color on Pluto and other redder, more primordial objects, comes from complex organic molecules that Carl Sagan called tholins. “When you see something red in the outer solar system, generally that’s an indication the object is covered in complex organic molecules,” Northern Arizona University astronomer Stephen Tegler told me when I toured the Astrophysical Ice Laboratory before the New Horizons flyby. The lab simulated Pluto’s ice on thin films so that astronomers would better understand what they were looking at. When sunlight reaches Pluto’s surface, blue light is absorbed, showing our eyes red. And while Pluto was known to have a red tint before New Horizons flew by, it wasn’t really considered red like many of its neighbors. So, 2014 MU69 might have a truly surprising appearance once we finally see it. “This primordial population that is going to give us the largest lever arm for understanding the physical properties of the early solar nebula,” Benecchi says.